Funny you mention contrails, because the last couple of days since temperature dropped here in east Germany we have a lot of contrails! Cargo planes have gotten louder, I swear, as if the new atmosphere were conducting sound a lot better with its new composition. Normally those planes almost couldn't be heard in the past, they were a 'barely audible colorful background noise' at most. Are they flying lower now, because of changed the atmosphere?! Annoying as heck!! Meanwhile, I'm sure the global warming nutjobs will spin this as global freezing due to global warming. And meanwhile, they keep on trying to think up ways to further cool the planet??? We sure do live in Bizarro World. Just saw the following; can I call 'em or what?? In case the upper layers of gas surrounding the Earth drop lower due to cooling, one might expect that the altitudes at which the incoming space particles like meteors will meet resistance from these gases also will decreases. In other words, they might light up a slightly lower altitudes. Good point. Also, we don't know what other possible effects such a shrinking of the atmosphere can have, especially coupled with the failing magnetic field. Here in the Laurentians, around 100 km north of Montreal, we have been having some real cold nights - near ground freeze - for past 2 weeks. The next 10 days do not seem to indicate much change. It's either raining or cloudy for the coming week ahead with temps just above zero at nights. In our memories, this gradual change towards winter usually begins mid-November, so we are definitely experiencing colder than normal temps, and the first ground frost is expected within the next 72 hours. That is causing problems for the farming community for sure. It was 6 C this morning, in SW France. Not at all normal. 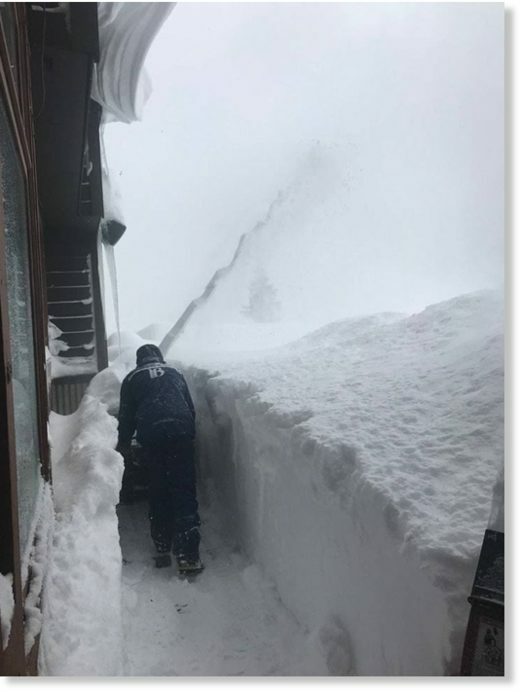 Probably people have caught this on SoTT.net - Record snowfall wallops Calgary, Alberta in 1st storm of season. It's a mess for this October start. By the time it is finished it may breach the 1914 record and there is more to come next week. It snowed hard all day in BC's East, and the mountain elevations may get near a half a meter of snow. Heavy snow continues over southern Alberta tonight. Intense bands of snow are producing visibilities of less than 1 kilometre. General snowfall amounts of 20 to 50 cm were reported Tuesday. Another 10 to 20 cm is expected tonight with amounts possibly up to 40 cm in the Crowsnest Pass region and under the more intense snowbands. At the extreme, that is possibly 90 cm in some locations (shy of a meter). By recollection (mentioned in other posts), there are areas of some significant snow pack deposits from winter 2017/2018 that now sit under fall 2018 snow - multiyear snow. I did not check Europe, yet it might be the same in certain locations. Despite the mid July summer wildfires around here and a couple of days of 40+c temps (it was noted on one fire in Parks Canada under 40+c temps that last years snow was very much in evidence adjacent to the August fire - strange juxtaposition), almost all the nights were cool, some unseasonably and snow came (mountains) July 2nd, late August and multiple times in September (13th was big), and now heavy on October 2nd. Interestingly, for the first time in a while, there was no frost in the valley here until the 27th of September (keep an eye on this regarding the garden). Of the fires, the fire behavior was either extreme (it was always posted extreme) or by observation moderate/low all within the same areas - some fires burned hot (Rank 6) and raced to the top of mountains while adjacent slopes within a few hundred meters did not even climb off the forest floor up into the forest canopy (Rank 1.5 - 2). From planting the garden at home there seemed to be about 20 - 30% less growth overall, and this seems to be a factor of the cool evenings (including May/Jun and part of July) and the smoke filled atmosphere of much of August. Last observation deals with snow avalanches over the last five years at least - they go up and down in severity due to factors. However, you can easily map avalanches in the terrain over hundreds of years (alpine/sub alpine/valley bottoms - the main paths, the forests vegetation (which also looks to return intervals) and predominate wind loading etc.) and yet there have been new paths formed from snow deposits above, from new wind loading patterns that have taken out new forest terrain below. It is a hit and miss observation that depends on knowing what was there before and what was not there; or direct study of the new path (or reviewing multiyear mapping of mountainous/forested regions). I put this in the same camp as the Inuit discussing the changing winds of the arctic regions (or as layed out by old Greeks who looked at this and named the rotating or oscillating directions). Like many people, with all the talk of AGW causes in the main discourse, it is hard to actually have a discussion on anything regarding climate history with them, let alone discuss questions from the non-promoted science of it (and forget talking about cosmic aspects) when they don't want to hear anything that conflicts - nothing new here. From a local perspective, though, the more and more one looks, the more things that people seem to take for granted as existing unchanged begin to appear much more change and unpredictable. We may feel we have a solid view of the last 200 - 500 hundred years (and we somewhat do), yet take it back further and the view dims to the more unknown; and that is even by the spade that seems to throw up uncertainties in some location. More likely, there were wild swings. Forget the arguments, debates and attempts to win over AGW alarmists — and just prepare. ... in both sources they blocked out the key information when she went to show the charts. She talks about it, but the geo physical union was so shocked by the figures that she showed that they they wouldn't post them in the video. And then on the other channel that monitored it, not only did they not show it, but they doubled up the audio and made an echo so you couldn't even hear what she was saying during it. It should have been 35-40 years, isn't it? No, her slides say it's 350-400 years. I guess that's why she's calling it a "Super Grand solar minimum". 350-400 years is plenty of time to build up a proper ice age glacial cover. Between comets, earthquake and other events, the Earth will be hardly recognizable by 2400.